Will you still be using Windows in four years? Analysts predict that Windows will have some stiff competition for the dominant operating system in the next few years from an unexpected place. According to research firm Gartner, Google's Android OS, not Apple's OS X or iOS, is on course to overtake Windows as the most used operating system in the world by 2016. Currently, Gartner's data shows that there are only 608 million Android devices in use compared to 1.5 billion Windows machines. However, by 2016 Gartner expects those numbers to flip, with as many as 2.3 billion Android devices surpassing a projected 2.28 billion devices running Windows. While it's interesting that Android could be the top OS in four years, it's more interesting that Gartner decided to pit the Android mobile OS against Windows in the first place. 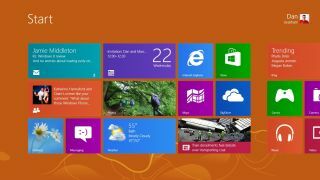 Even with the imminent launch of Windows 8, which will usher in a wide range of new smartphones and tablets, Windows is still primarily considered an OS for desktop and laptop computers. Arguably, each operating system's primary devices serve different purposes, allowing for the possibility of co-dominance where each OS succeeds without competing for the same marketshare. However, Gartner's data suggests otherwise. The research firm notes that worldwide PC shipments are on the decline, dropping 8 percent in the last three months alone, as more users turn to smartphones and tablets as their primary computer. Microsoft's Surface tablet and Windows Phone 8 devices hope to bridge that gap, but the software giant's lackluster history with mobile platforms doesn't inspire confidence that it can gain significant ground against the well-established and widely available Android OS. Technology is a fast-moving field though, making four year projections a tricky thing. Four years ago this month Android just launched with its very first handsets, and the market has changed considerably since that day.